Young, skinny, wiry fellows not over eighteen. Must be expert riders, willing to risk death daily. Orphans preferred. Wages $25 per week. Although it lasted for only nineteen months’ duration from April 1860 to November 1861, the historic and venerable Pony Express consisted of relays of mail-carrying men on horseback covering 2,000 miles of trail at breakneck speed, oftentimes traveling 250 miles in a day to and fro between California and Missouri. Its trail was a short stretch from the town of Lebanon, Kansas -a straight shot south of Red Cloud, Nebraska on Highway 281- and home to Chad Stanley, another fine example of the good crop of Kansas boys who contributed to the Husker’s bountiful harvest of 1991’s recruiting class. Question: You grew up south of the border in Kansas, right? Chad Stanley: I’m from a little town in north-central Kansas called Lebanon, Kansas. It couldn’t be more in the center of the United States. As a matter of fact, the exact geographic center is 3 miles south of our house. And Lebanon didn’t have a high school. Smith Center was the high school. They had their kind of a football dynasty in the state of Kansas, so I was pretty blessed. Q: You know, as a kid, whenever the weather would get nasty and inclement it seemed the TV weatherman was always mentioning Smith Center, Kansas. CS: Oh yeah, in Lincoln there with Ken Siemek? Yeah, he always brings up Smith Center. They had the nation’s longest winning streak in high school football. Quite a dynasty: they’ve won 67 in a row. I was kind of lucky, Paul, even before I got to Tom I had a great staff, a legendary one in high school. Q: How did you end up at Nebraska? CS: Well, it was kind of unique back then. My dad was a K-State grad. My uncles -neither of whom graduated from Nebraska- they were big Nebraska fans when I was growing up. (That was before Bill Snyder got to Kansas State. They weren’t very good at football.) And when I was a child, from age 10 through 17, we went to a lot of games at Nebraska. We maybe missed only two or three home games in that span. We got all the Nebraska TV stations and knew all about Coach Osborne and respected him. I went to the camps and I got to know the coaches really well, had some Division 1 scholarship offers. But like a lot of kids, a walk-on deal at Nebraska back then was better than getting a scholarship from half of Division 1 because you were treated so well, with a quality program. Financially, it wasn’t as good, but the experience of being part of a championship program is what drew me to Nebraska. Q: What position did you play? CS: I played fullback. Played for Frank Solich. Q: Your recollections of Coach Solich? CS: Coach Solich? I will always remember him as the best running back coach in college football. He was tremendously detailed and a tough guy. When he played he wasn’t a real big guy, but to this day he still lifts weights and he’s stacked up. You can just see that he’s a tough guy. And he instilled that in all of us players. We fought for every inch on the football field. There was no running out of bounds, as you know. Great technician, just a tremendous running backs coach. Also a tremendous coordinator up in the box during games. 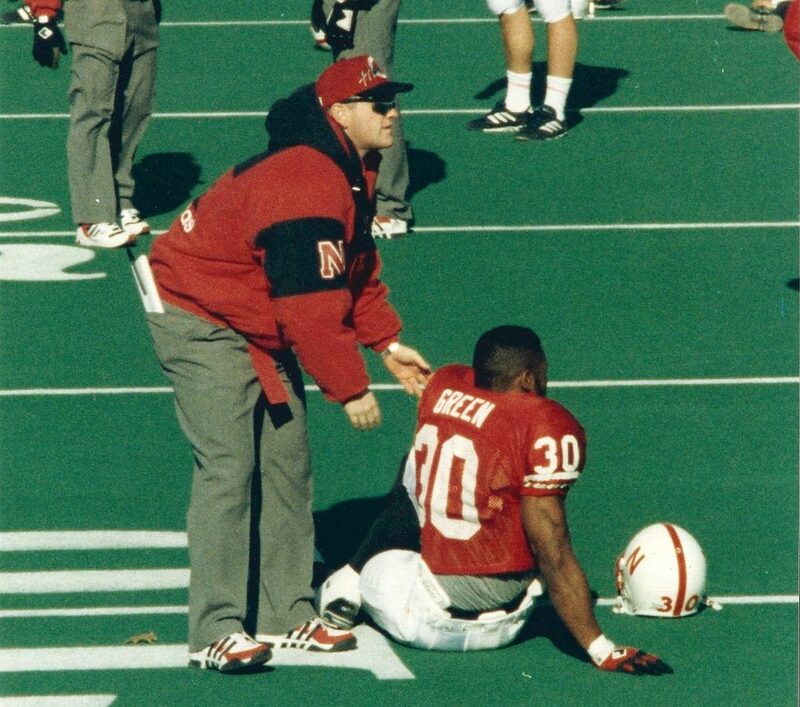 One thing he doesn’t get enough credit for during the Tom Osborne era was when he was up in the box offering suggestions to Coach Osborne, which I got to see firsthand as a coach. He was really a good X’s and O’s guy up in the box. And they had some good box coaches; they could really dissect a defense from up there, and he was very good at that. That’s what I remember about Coach Solich. Of course, we all know what a tough, tough transition that was to follow a legend. And he did a good job. He’ll go down under-rated as a head coach in Nebraska history, but as head coach his winning percentage speaks for itself. CS: Exactly. It was an embarrassment, frankly. And I was very involved then as a GA. It’s bad for the sport when a guy who wins over seventy-five percent of his games gets fired. Q: When was your first fall camp? CS: That class of ’91, which was an interesting class. If you remember back then -of course you were there, Paul- that was coming off some seasons in ’89 & ‘90 that were a little disappointing. There was a little strife, where the direction of the program was going (even though it was consistent with 9-3 every year), but Tom really made some changes that year we arrived: they started recruiting more southern athletes, they went to a 4-3 defense, and there was a higher-caliber athlete started showing up from that fall forward. And that was the class that I came in with Brook Berringer, who was my best friend in college there. We were roommates together, both from Kansas coming in together. Brook was a scholarship quarterback. There was Tony Veland, Clester Johnson, Brett Popplewell, some of those guys. That class of ’91, it’s funny, we’d sit around as a class. And we were just young bucks, you know? And I remember some of the leaders of that class like Aaron Graham, who were super-confident and saying, “In our career here we’re gonna win 4 conference championships and a couple national championships.” I remember guys saying that. Guys talk when they’re young, and gosh darn, during our careers that exact thing happened. And some of us weren’t super contributors. I was never a starter or anything, but I was a contributor and went on to coach and stuff. But that was a special class. I’m really proud of coming in that year. It was happenstance and a blessing, but it kind of picked up to a different level starting in 1991. Q: Did you know Brook before you arrived at the University? CS: I had heard of Brook. In the state of Kansas there aren’t a tremendous amount of seniors from the state who go to Division 1 football every year. Maybe 15 or so. I’d never met him, but when I signed my papers to walk on I called him after I heard this tall, gangly quarterback from Goodland, Kansas was going to Nebraska, and we became friends thereafter. Actually, do you remember the trainer Duke LaRue? He used to call us “The Kansas Bus.” He always used to say, ”Here comes the Kansas Bus!” Brook really was a tremendous player, grew to be a big, young man through the strength staff and you guys. He could move, he could run and throw. I guess the Broncos told his mother they were gonna draft him that weekend he died in the plane crash. But we had a good time there. Q: What stuck out about your first days on campus? Christian deserves a lot of credit in changing the culture to a championship culture. That guy was a total competitor. He was a Charlie McBride guy, I’m telling you. The intensity level in practice going from the Peter brothers right up to Grant Wistrom? It was high when I got there. You had the Trev Alberts’ of the world. There were good Blackshirt defenses, but hey, they grew to be great Blackshirt defenses. There were Doug Colman and Phil Ellis in my class, and I know I’m leaving some guys out, but we were a tight-knit class. 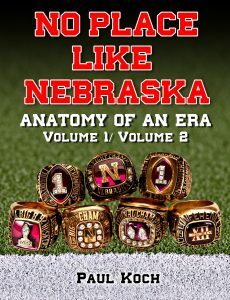 It was a big class, back when you could sign 30 scholarship players, and Nebraska had a one up on the game because they’d bring 25 of us walk-ons, and out of a class that size you’re gonna have some guys. CS: It was brilliant what Coach Devaney and Coach Osborne devised, because as everyone knows, the population of Nebraska being one million and a half and its proximity to population centers, you had to do that. Q: A numbers game in many respects? CS: Bring in the numbers, get them in a good system and certain players are gonna pan out, and that way you cover your attrition. And there was attrition, but you had a solid base of guys at the end. Q: What was it like for you? I assume you were in the North locker room with all the other freshman at first, right? CS: Yeah, North locker room. And it was surreal those first meetings when Coach Osborne steps into that room. This was back when the freshmen reported early. Of course, the rules kept changing (back then you had the 105 rule), but back then all of us freshmen reported early. Walk-ons and scholarship guys, you’re learning plays, it was a whirlwind. When Tom Osborne steps in the room it was a little surreal, like Clint Eastwood walks into the room from the Old West or something. Q: That’s so funny you say that. I think the older they get they’re starting to resemble one another. Wouldn’t it be great if a guy put together a movie about Coach Osborne’s life and had Eastwood in the starring role? From the first meeting on it was just crazy, because there are no pro teams in Nebraska and you go to the mall and every fan there knows who I am. A walk-on guy that’s gonna redshirt that year and not gonna play, and everybody knows who you are. So it’s a shock, because here you are under a legend, and then it’s rock star status for you everywhere in Lincoln. Q: Were there any perks to this rock star status? CS: Sure there was. It opened so many doors for you. It’s such a tight-knit community, and if you’re a football player in the state it just opened doors for you. You might get to visit some needy kids at the hospital, or just things that the average student didn’t get to do. It was just a blessing. Q: So you’re in that first meeting. Anything catch you off-guard? CS: You knew it was special in how detailed it was and how much they threw at you the first few days. I came from a high school where we ran the wishbone and it was two or three plays you run to the right and two or three plays you run to the left and just dominate them. But this was so detailed. I remember that first week with Coach Solich going over the steps, “This is how you lateral step toward the guard,” everything was so precise, all the main points. And you look around the room, Paul (the big adjustment to me was not the thinking part), but you get around all these great players from coast to coast? The speed of these guys! It was just a whirlwind. I was a tailback in high school, so I’m arcing out as a fullback to block these linebackers -and in high school it’s no problem- but these guys, they go from sideline to sideline and it’s a blur! And George Darlington has the safeties all lining up 10-15 yards deep, so they’re in the backfield in a heartbeat! It was a different deal. Q: High school on nitrous oxide, huh? CS: The speed was incredible. They recruited a lot of kids who could run. Q: How did Coach Solich teach toughness? CS: He just instilled it in us by the way he carried himself. I mean, he was a tough guy. He was a caring guy, don’t get me wrong, but he was a tough guy, like I said. Here was a guy in stature, maybe 5’7” 155 lbs., and he had Popeye forearms. I remember the very first day we went out there in just helmets, no shells or half pads or anything. We’re doing ISO blocks, and he wanted us to punch each other in the sternum. Chris Norris and I were paired up and about knocking the wind out of each other, we thought he was crazy. But there was a method to all the little things, you learn quick. Of course, I came from a physical program and knew this, but there was a difference between being injured and hurt. And Coach Solich expected you to go out there and practice hurt. Not injured, but hurt. And you loved the way he would show the old tapes of Rozier and Rathman. We battled for every inch on the football field; you did not go out of bounds unless it was right before the half or a time-saving situation. Q: The ‘quit’ isn’t in you? CS: We took it to defenders. People feared Nebraska backs because we were gonna do the lift drill and punch them in the sternum. I loved the story of Tom Rathman they used to tell, when he’d done the lift drill on an Oklahoma linebacker and broke his jaw. Just by doing the lift drill right into his chin! And Coach Solich was good at that, in instilling that toughness. CS: Yep, and I think Coach Solich was taught by Mike Corgan. And he was a tough guy, too. Frank was the freshman coach for awhile, and I think it was just passed on down the line. He was a character. I didn’t meet Corgan, but I’ve heard the stories of him. When I went to coaching I heard stories about him. He was a tough guy. Q: So you were a fullback. How long did you play then? The full four years? CS: I played from ’91 to ’94 and actually could have played in ’95, but Paul, I had a couple knee injuries: tore my ACL and MCL one year, and tore my MCL again. And you knew I wasn’t ever a starter and wanted to coach, so I just jumped into it a year early as an assistant under Frank there and learned a lot. Got to be a student assistant on the ’95 team. CS: Yeah, no doubt, because that was an incredible year in a lot of aspects. One thing I’ll never forget from that year was the mood in the locker room before the Florida game. I have never seen nor will probably see again a more sure outcome in the pregame, even in the hotel. Just in the faces and the attitude and the determination. That was an organization that not only knew it was going to win a national championship, but decisively. That game was decided before it was ever kicked off. It was just an incredible mood. Q: What contributed to that mood? CS: Just the confidence that was built. Obviously, we’d won the national title the year before, and this team was putting up mind-boggling stats and stayed relatively healthy, because that year Tommie got to play all year. Now, we dealt with some of the off-field stuff that year, losing Lawrence Phillips, but as far as health? We, especially on defense, we stayed pretty darn healthy. So you had two waves of players who played in the NFL: not just the first team defensively, but the second team played in the NFL eventually. Q: I think it was Bryan Bailey who once pointed this out to me, but do you recall that ’95 spring practice when the second team actually beat the first team in the spring game? CS: I always said, if people could have seen some of our Wednesday practices before Saturday -especially for that Oklahoma game- it was about the best game in the nation, I promise. Especially the goal line drill, because it was the ones versus twos and twos versus ones. We had the best talent in the nation on both sides of the ball two deep in the same program. Probably a lot like Bryan sees at USC now. Very similar. Q: He actually tells those guys at USC that they couldn’t hold a candle to those Husker teams. He readily admits that they have the talent but they’re not as tough. CS: There’s too much to do out there in California. There really is. They’re not as focused. Q: So you make the switch to coaching and probably spent time on the sideline and up in the press box during games? CS: That first year as a student coach was very interesting, because I got to go up into the end zone during the games with the Graduate Assistant coaches. It was with Mike Grant on offense and drawing the defenses during the game that would eventually get in front of Coach Osborne, so it was a really important job. Mike would watch the fronts and the ’backers and I might watch the secondary, and Tom would base his play calling off these drawings, so they had to be accurate. I’ll never forget, my first game ever as a coach was down at Stillwater, Oklahoma. A Thursday night game. (It was the debut of Terrell Farley, what a great player that guy was.) 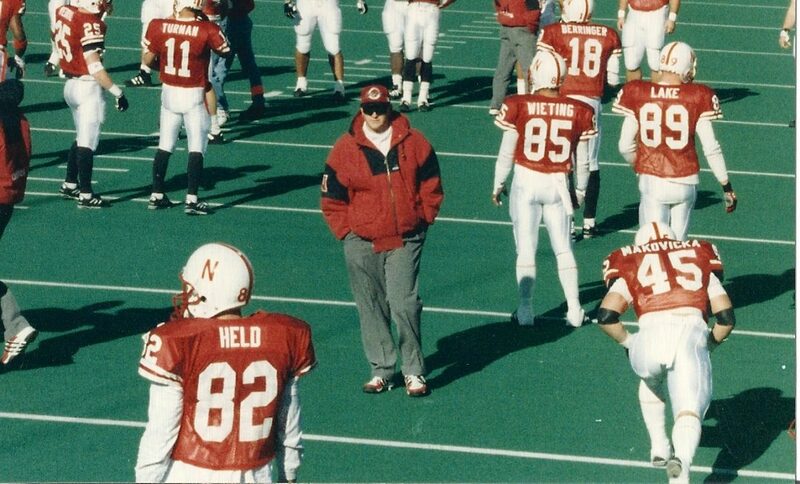 But we had these kids running down these cards to Coach Osborne, we’d get the spacing of the defense and everything. So I learned a lot of X’s and O’s that first year. I knew them as a player, but even as a student coach it picks up a whole other level; kind of a mentoring of me, being a young padawan, a young apprentice in ’95. We had such a great offense and people were throwing the kitchen sink at us to stop us. I got to see a lot of junk on defense. Q: Do you recall the most creative effort? It was always a challenge to face the Stoops brothers at K-State, they were pretty good defensive guys, we hadn’t played them that year very well. Through those years we would beat them every time, but they were good coaches. It was a good challenge, they were very sound. CS: Yeah, and I did some work on the field in ’95, too. And in ’96 I kind of worked in the recruiting office and the film office, I was kind of waiting in the wings until Mike Grant was done with his GA shift and take over for him. So I’d do some administrative things and helped out in the office. 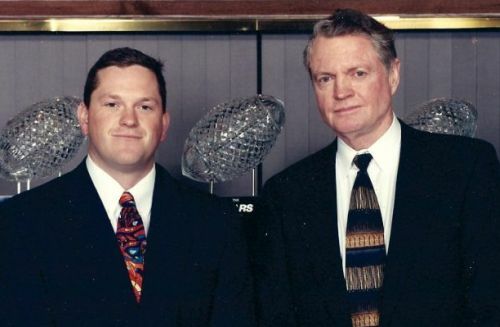 And in ’97 through ’99 I was a Grad Assistant with both Tom Osborne and Frank Solich, I was right in the heart of it during the transition and Tom’s last year, winning it all for Tom. So I was there a long time. I was there for a decade, during the heart of the whole thing, ’91 through 2000 both as player and coach. Q: So, looking back on it, what do you think really contributed -aside from the talent being one thing, because some other teams in America had talent, too- but what played a major part from your freshman year to your senior year? CS: I think that some of the fringe things that Nebraska did so well was cutting edge. Obviously, as you experienced yourself, Boyd had a cutting-edge strength program. It was ahead of the game in the ’80’s and through the ’90’s, revolutionary in the early ’90’s. I believe we had a head up on everyone else in the strength and conditioning part of it. We developed players from really good athletes to great athletes. We had the walk-on program that gave us a leg up, and the continuity of the coaching staff can’t be underestimated. Tom was a unique guy to be able to blend a lot of personalities together. You know the guys: there were some different guys from different lifestyles and liked different things. Of course, we all do. And of course coaches have egos, we all do. To blend all that together into a common theme of teamwork and exceptional coaching? 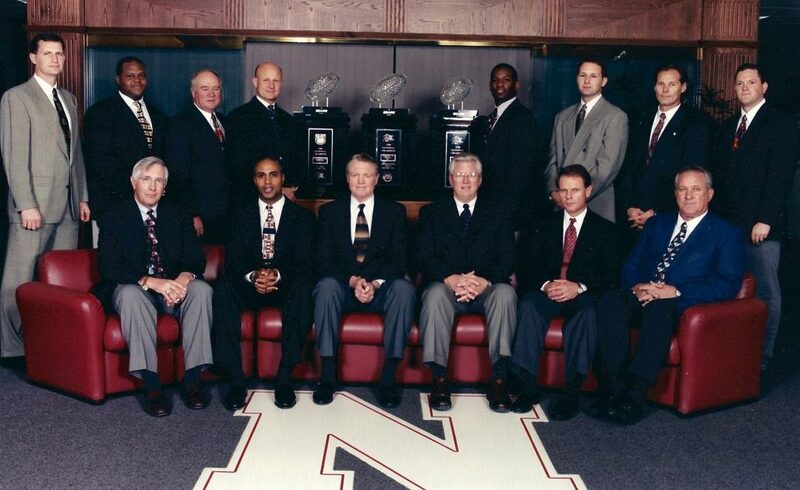 And back then it wasn’t like today where coordinators were bolting for a head job, and they felt loyal to Nebraska. And quite frankly, part of that run being a coordinator at Nebraska was better than being a head coach at most places. And they were paid well and were supported -not like now- but back then Tom did what he could for them and kept them. And I think along with keeping the coaches together, keeping the system together, they had that academic program with Keith Zimmer and Dennis Leblanc and all that. And the training table was second to none. Just all the fringe things, they all played a part in creating a championship atmosphere. It wasn’t just football. We wanted to have the most academic All-Americans, we wanted to set strength records. It was constantly creating a culture of achievers. And when you’re creating a culture of achievers among a group of young men you can accomplish great things. That was the Devaney/Osborne program they created, and it really morphed itself in the ’90’s when they recruited some athletes from Florida and Texas and Louisiana, beating the southern schools on athletes, becoming a national recruiting power and getting the type of speed in there, with the type of offense we ran, a multi-purpose quarterback. There won’t be another decade like it in college football. I don’t the think the NCAA would allow it. There’s a lot more parity -some schools like USC and Oklahoma- but you can’t do it, the scholarship limits, with Title IX and the budgets, it’s tougher now. It really is.